This entry was posted in Charlottesville, Travel, USA and tagged flowers, spring, trees, Virginia. Bookmark the permalink. I love those swallowtail butterflies. You were lucky to get that one to hold still long enough to get a photo. They are really pretty and it took a while to get this picture – the butterfly just kept moving! I know. I’ve tried to get the same kind of photo and finally gave up. It’s definitely a challenge (but worth it)! I always try to get a shot of a butterfly when I see one but they rarely oblige. Glad you caught this one. Looks like a lovely place. Thank you Jo – soon I’ll be ready to do one of your Monday walks! You’ve captured spring with lovely flowers and butterfly! Thanks – it was one of those times that it really looked like spring! I’ve heard it’s very beautiful there and it looks as though I wasn’t mislead. I’ve found a lot of wonderful places already and I think there are many adventures ahead! Can’t forget about butterflies, they’re probably the best insects to see during springtime. Love your shots here of the nature around you. Thank you and I was really happy to see that butterfly! It looks like a beautiful place and it’s lovely to see spring colour and a butterfly. There are lots of interesting places here and I’m really happy to see so much in bloom already! What a lovely area you have chosen to live. Beautiful photos. Thank you – I think living here is going to be great! What a beautiful place you’ve settled! I love these photos, Meg! Spring has definitely bloomed where you are! It will be nice to see these same areas in other seasons. And your header photo is really perfect, Meg. It’s gorgeous! This is a beautiful series. I love them all, but the butterfly is my favorite! Thanks Naomi – I was amazed at all the wonderful sights that day! This is the time of the year when you will really appreciate your new home. Lovely photos. Thank you Karen – I know that I’m enjoying spring a lot this year after such a long winter! Gorgeous photos, Meg! It must have been a beautiful day. Ah Spring. My thoughts are turning to my travels. These are great photos Meg. Thanks – spring is a great time to look forward to traveling! Beautiful photos Meg – I love that the spring flowers always seem so fresh and new after the winter months. 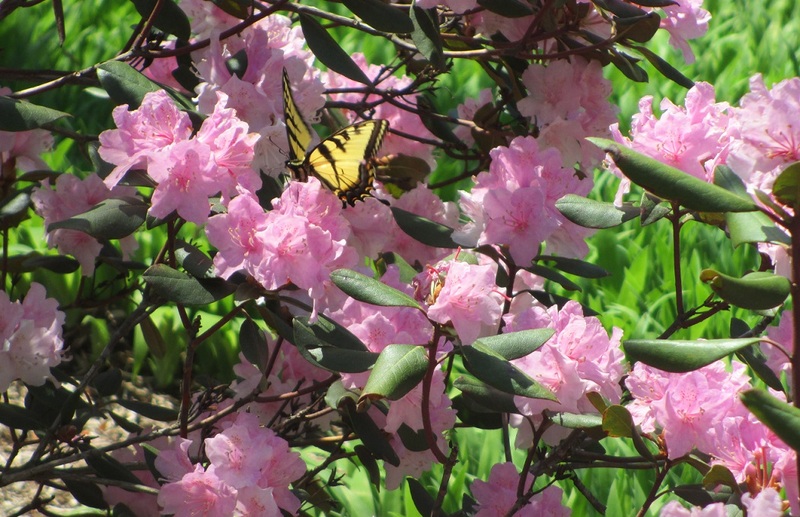 Thanks Suzanne – these flowers were extra special after this winter! Oh is that what Spring looks like! Sorry I am being a bit cheeky. We just had three days of snow.The poor plants in this area are trying so hard. Your photographs are beautiful! Sigh…. Thank you Thea and I really hope that spring arrives soon for you – it’s much too late for snow! Virginia has so much to offer. I look forward to your exploration. Thanks Patti – it’s going to be fun this summer and I can’t wait to get started!